Sliding doors are a popular choice thanks to their blend of style and practicality. Minimalist aesthetics combine with an ability to maximise space. 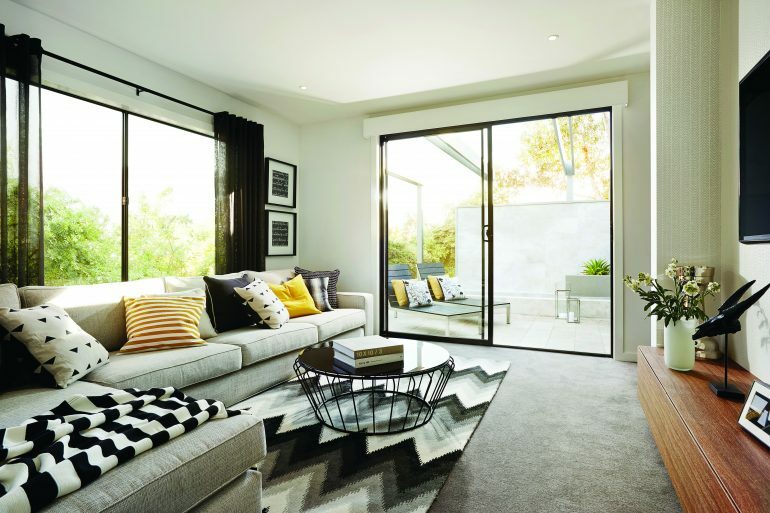 Given the doors run parallel with the track rather than opening on a hinge, sliding doors are a great way to make the most of smaller, cosy spaces while still opening to the outside world. Here’s a simple guide to installation, which applies to our Standard Sliding Door Range, with 2 panels for smaller openings. As always, make sure you’re wearing appropriate safety gear for the site you’re working on and tools you are using. Measure the height, width and depth of the product, and of the opening you’re installing into. Measuring height, width, and depth. The size of the opening needs to be 20mm wider and 30mm higher than the product, to allow for a square and plumb installation. At this stage, it’s also a good idea to check if any installation requirements apply to the product you’re installing. These could include specific head heights, special finishing details, or coupling to other products. Flashing needs to be determined by the builder. When installing, flashing needs to be pulled forward and fixed to the face of the stud. This can be done with a simple staple gun. Place the spirit level on the slab or floor, and pack level where the product will sit. If packers are required, fix them into position with brad nails so that they don’t move around. Place a mark on the reveal of both jambs: 100mm from the top, bottom, and in the centre. On the opening side of the product, the centre hole can be positioned above the handle. Pre-drill a hole at each mark with a 3mm drill bit. Place the product into the opening from the outside. A standard installation allows for 10mm of plaster on the inside, so using a 10mm packer or the thickness of a simple brickie’s ruler as a guide, overhang the reveal back into the house by 10mm. Fix a nail into the stud through the pre-drilled holes nearest the sill on both sides of the product. Do not nail them in all the way. Fix a nail into the stud through the pre-drilled hole at the top of the reveal. Again, do not nail it in all the way. Repeat on the other side of the product. Holding your spirit level against the jamb, check that the product is both square and plum. Measure the product diagonally in both directions to ensure it is square. Ideally you want both measurements to be exactly the same, but within a couple of millimetres is ok. Use the pinch bar to gently move the product into the correct position if required. Measure diagonally across the product. Before packing and fixing off, it’s good to check how the product is operating. You may need to adjust the panels at this stage. If so, please see our video on how to adjust an A&L sliding door panel. Once you are happy with your door’s positioning, pack between the reveal and the stud above the nails and drive all the nails home. For taller products, you may need to add additional fixings along the reveals on the jamb. If so, follow the same procedure of pre-drilling, packing and fixing, while ensuring the reveals remain plumb. Once your door is successfully installed, it’s time to focus on optimum performance for the long haul. Every A&L door is engineered for durability and reliable function, but there are specific steps you can take to care for your products. Learn to keep your doors in peak condition with our comprehensive care and maintenance guide.